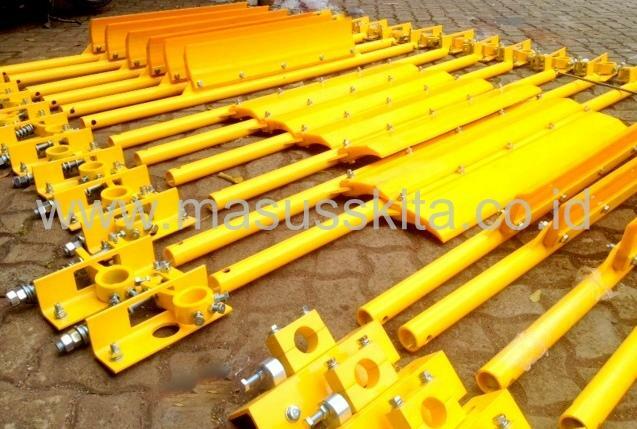 Masusskita United adalah perusahaan yang menjual belt cleaner / belt scrapper berbagai type seperti primary belt cleaner, secondary belt cleaner, V belt cleaner, diagonal plough, V Plough, belt cleaner reversible , dengan jenis adjuster spring, bandul ,bolt, dll. Produk kami sangat berkualitas dengan garansi 12 bulan dan memiliki sertifikat manufacture. Kami juga meyediakan sparepart belt cleaner yaitu blade belt cleaner baik itu material polyurethane maupun jenis tungsten carbide. Selain belt cleaner kami juga menjual partconveyor lainya diantaranya roller conveyor ( carry roller, impact roller, return roller, steering roller, roller rubber disc, UHMW roller, HDPE roller, gravity roller, teflon roller ), pulley conveyor ( Drum pulley, head pulley, snub pulley, bend pulley, tail pulley, wing pulley, counterwidth pulley ), belt conveyor, conveyor metal detector, magnetic separator, mechanical sampling, coal sampler, belt scale, belt weigher, rubber skirt, quick release clamp, impact cradle, impact bed, safety conveyor switch ( pull cord, belt sway, speed switch, chute switch, alarm horn, paddle switch, limit switch, level switch, belt alignment switch ), water scrapper.